We work for a living, our families, our dreams and the future. However, the stress can take its toll on our body, mind and soul. Imagine waking up at 7 am everyday and getting ready for work. If you have a family, add a couple of hours earlier to wake up the kids and prepare them for school. Now, you hit the road and beat out rush hour traffic. Fortunately, you arrive 15 minutes before your time, just enough to have a quick coffee break and fix yourself for an early meeting with a client or your team. Time flies so fast as you handle tasks in the office: answering calls, replying to emails and preparing reports and documents. Before you know it, lunch break kicks in. You either call up for a delivery, bring out a packed lunch or go out with colleagues. If you are in a business meeting, you might even end up in a working lunch set up. You are just half-way through the day, feeling tired already? Of course! You are probably thinking about what’s left to be done, how to finish your pending tasks, when to call up a new client for a meeting and many more. Work is necessary. But keeping yourself relaxed and happy is equally important. 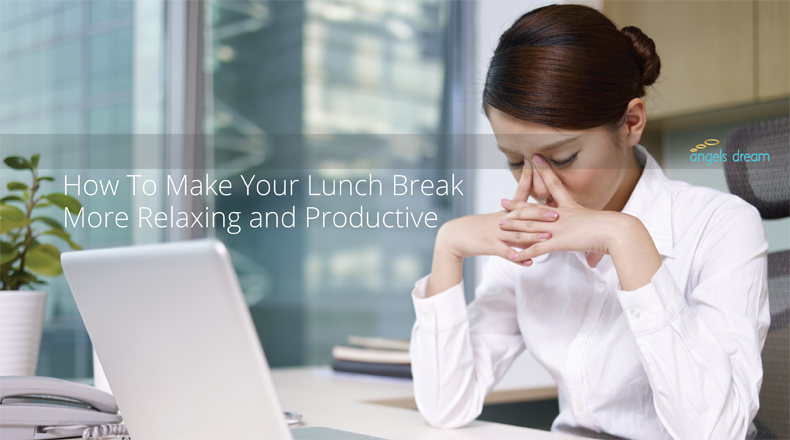 So, treat your lunch break as a personal time and give yourself an hour to relax and unwind. Is an hour too short? Of course not. Think about this, you have 60 to 90 minutes of quality time to be used for relaxing activities to give you more energy to last through the day. Try to leave the office during your break just to get a different ambiance. Eat out with a friend or a colleague. Lunch break is not always about food. Seriously, the eating part can only take about 15 minutes. What else can you do with your spare time? Have you thought about doing simple yoga exercise? A quick meditation exercise can help you relieve some of the stress that accumulated within the first part of the day. No need to bring it along the entire day. Shake it off. Look for yoga classes within your area or organize one for you and your colleagues. How about taking a time-out to visit a nearby spa? Drop by for a special spa retreat. You can take a free daily yoga. Then, experience a relaxing massage or a clarifying facial spa. Finally, complete your relaxing break with a healthy and refreshing lunch by the pool side cafe. Sounds good to be true? Check out Angels Dream Spa for a complete list of services and treatments. Try it once and your lunch breaks will never be the same again. Take this as the mini break. You deserve it.